Some tested theories have given us a new lead on information regarding the Strawman Syndrome attacks, meanwhile whatever the Order is up to continues without issue. I really can't say I like where this is going but would like to remind everyone that there is an evacuation plan in place for you and your families in a worst-case scenario. Meanwhile it continues to be painfully obvious that not everyone who says "I Am Charlie" (Je Suis Charlie), is. Especially not this guy, who I am told is The Prophet Muhammad, despite his sign. I would like to elaborate on why this no doubt well-intentioned cowardice is worlds more dangerous than any number of depictions of Mohammad. First and foremost, it tells the Terrorists their strategy is working. That someone willing to die in order to kill more can make you all so very scared that you will purge that which offends them. In practice this could not be better cheer-leading if they formed a human pyramid and really shook those pom-poms. Meanwhile your paranoia plays right into the hands of the extremists on the other side as well! It's not as if, despite my unusual perceptiveness, I am the only one seeing this. Only where I see cowardice, they see their Muslim Takeover conspiracy theories coming to life. 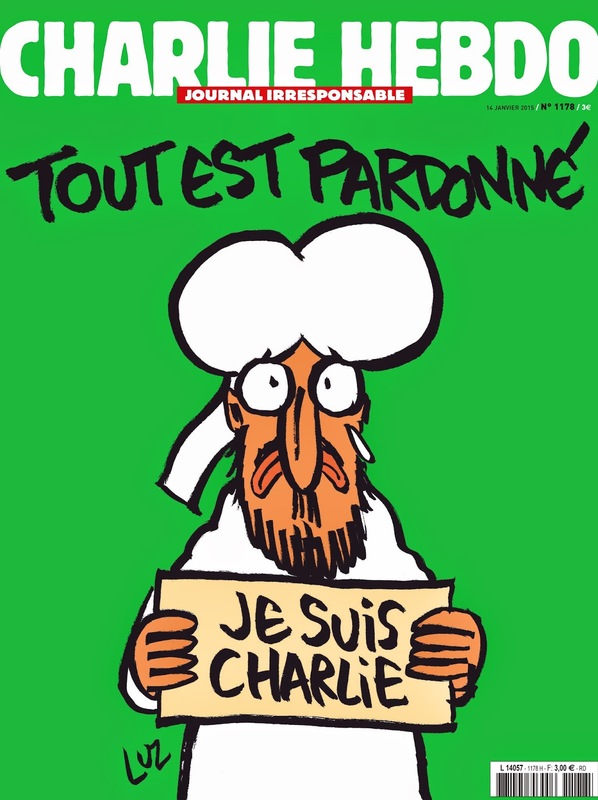 In the meantime, Charlie Hebdo's message about the importance of free speech and rationality is being perverted by the French Government to come down on that very thing. And yet, for it's abuse, an alarming number of people are vastly more scared of being called a racist, however untrue, than the loss of their personal freedoms. There are people in forums and Tumblrs ranting about how the Charlie Hebdo caricaturists were racist as if even if it were true- and it could not be more profoundly false- that would change anything. No one should be murdered over a drawing. These so-called journalists who are terrified to show drawings are furthermore behaving as if there are precious few Muslims who can see a cartoon without going into a murderous rage. This should be absurdly offensive in itself. "These days critical thinking is what you thought of a TV show." Now once again I would like to note that even if you are a Muslim inclined to take your faith with deadly seriousness and feel that images should not be made of the Prophet then there is great news. No one alive save God themselves knows what he looks like. An image of him cannot be properly made in any objective sense. As such, any image you agree is of Mohammad- especially THAT Muhammad- is being imbued with veracity BY YOU. Why would you agree to do that? Especially if it is the work of some offense-seeking infidel? The ways of dealing with offense in a healthy manner abound if you will look for them, they just won't give you the brain-chemical high that getting angry does. There are people who additionally sincerely believe depictions like those above inspire violence against Muslims. On what evidence? On the contrary I am sure those of other faiths only have greater sympathy for someone else having to deal with the disrespectful or faithless as they have had to. What doesn't encourage empathy, however, is murder and justification for it. Meanwhile those of you who think it's great for the government or indeed ANY agency to dictate what people can and can't say for the fear of offense, you play right into the hands of those who wish to dictate what people can and can't say (the question of why becomes irrelevant when you can't speak). You take us that much closer to a culture of mindless obedience. And now, a palette cleanser and good thing from misfortune.